Have you ever been deeply immersed into a Minecraft adventure and thought to yourself: “This would be so much better if there were more ways I could suddenly and unexpectedly perish!”? If not, you need more adventure in your life! tkon99’s Accidents plugin for Minecraft 1.7.x makes use of Bukkit architecture to add some unpredictability to daily activities. If you have ever used a hammer or any tool that requires precise yet forceful swinging, you understand how common this is. 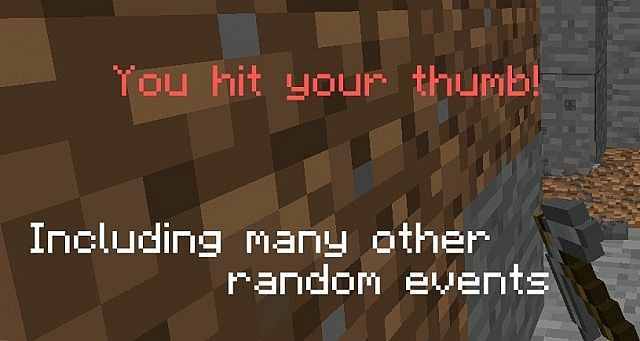 With this plugin, there is a 5% chance that at any given point while mining you will hit your thumb. … Okay, maybe hitting your thumb with a pickaxe is a little unrealistic. But the arbitrary possibility of an accident is definitely not. Players can also fall off of ladders at a chance of 1%. I’ve personally never fallen off a ladder, but I’ve also never climbed one while running away from zombies or carrying several tons of dirt in my backpack. The plugin is still in the early stages of development, and tkon99 promises weekly updates with added configuration of damage, chances, and additional accidents. Many users have suggested accidents and tkon99 has confirmed that some of them will be added. Stay tuned for more ways to die horribly! Download the latest version of tkon99’s Accidents plugin. Place the .zip file from step 1 into your server’s plugins directory. Run the server and wait for it to fully load. Restart your Minecraft server or login to your admin account and execute the /reload command. Run the server again. The plugin should be properly loaded.